At Christmas many houses around the City of Canada Bay are brightly decorated as part of the celebrations, sometimes with extravagant lighting displays. 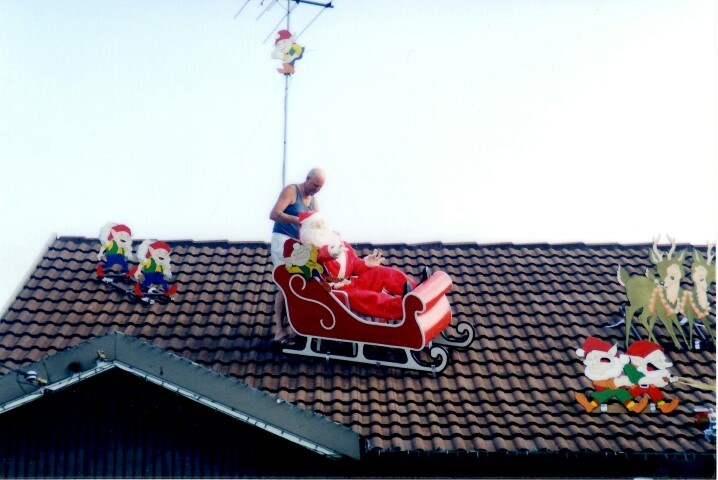 The photograph, above, was taken in 2001 and shows a man decorating his home in Reginald Street, Wareemba. It was an entry in ‘A Day in the Life of the City of Canada Bay’ photograph competition, held to celebrate the first anniversary of the City of Canada Bay. The City of Canada Bay was formed on the 1 December 2000 through the amalgamation of Drummoyne and Concord Councils. The suburb of Canada Bay lies midpoint between the two former Council areas so the name was chosen for the new city. The first Council meeting was held on the 12 December 2000. Councillor Michael Wroblewski was elected as the first Mayor of the City of Canada Bay while Councillor Angelo Tsirekas, the current Mayor, was elected as Deputy Mayor at that meeting.